What’s New, What’s Hot is Travel Weekly’s look at useful and fun travel gadgets, edited by Joe Rosen. First up, NokHoo Laptop Backpacks. Designed to fit laptops up to 16 inches in size, the fully-padded and water resistant bags have numerous zippered and side pockets and an easy-to-reach shoulder pocket. What really makes them standout is the unique, custom artwork that adorns each bag. They are available in four styles, characterized by their fabric, color and design work: Sirrush, DeLoverly, Raining Paradise and Icarus. 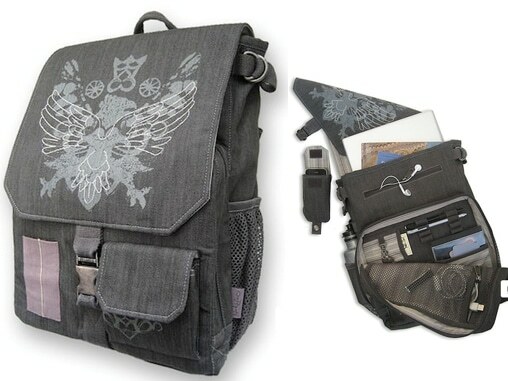 NokHoo Laptop Backpacks: NokHoo, according to Nicole Roberts, who first designed this line of stylish bags when living in Thailand, is the Thai word for “owl” and it is the wise traveler who has one of these backpacks at the ready when on the go. All NokHoo bags are fully padded, at once protecting you and your contents; have numerous zippered pockets, side pockets and an easy-to-reach shoulder pocket; are water resistant; and are manufactured to last. What really makes them standout, however, is the unique, custom artwork that adorns each bag, including screen prints and embroidery. They are available in four styles, characterized by their fabric, color and design work: Sirrush (“toasted sesame”), DeLoverly (red), Raining Paradise (periwinkle) and Icarus (gun metal gray). All fit laptops up to 16 inches in size. $150; www.nokhoolaptopbags.com. 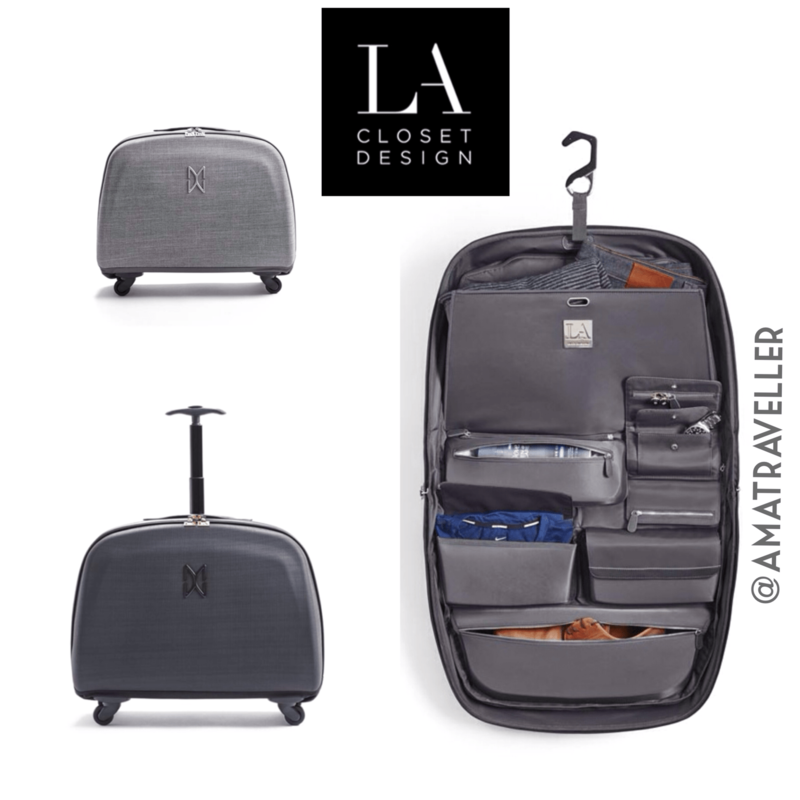 LAMOVE Mobile Closet: A joint project of luggage designer Max Mirani and closet designer Lisa Adams, this imaginative and functional product combines the organization of a wardrobe trunk minimized to the portability and practicality of a carryon (21 by 14.5 by 9 inches, with four swivel wheels). Featuring a hard shell case with a textile surface, the LAMOVE Mobile Closet has two separate sections: a garment portion for hanging dresses, slacks and blouses, and a removable wardrobe portion that can be zipped out and carried separately as a tote. Other attributes: a cantilevered shelf; magnetically closed pockets; a shoe section that fits heels and flats; a heat-resistant storage packet for flat or curling irons; and a detachable jewelry roll that can be used as a clutch or placed in a hotel safe. Two styles are available: Hollywood, with black exterior and gray interior, and New York, gray exterior and charcoal interior. Both have leather interior trims. $649;www.laclosetdesign.com. 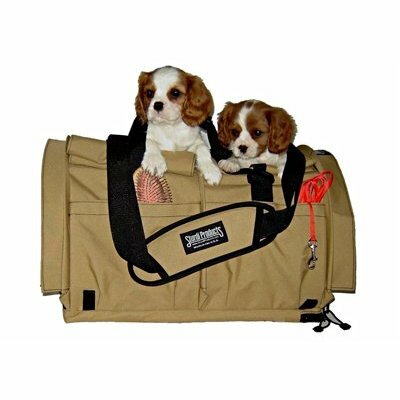 • SturdiBag Pet Carrier: This light-weight, in-cabin traveling bag, which includes a seatbelt, seatbelt safety straps, harness and privacy flaps, is collapsible, providing a safe and comfortable trip for your portable furry friends. Available in small or large sizes (the large, divided SturdiBag is capable of carrying two pets in separate compartments), the carrier is made from 600-denier polyester; has an adjustable, four-point padded shoulder strap and leather hand grip; interior fleece pad; zipper security clips; and a leash tether. $68 and up; www.sturdiproducts.com. • Classic Carrier: This product, from the aptly named LazyBonezz company, boasts breathable mesh panels for excellent visibility and ventilation; two sturdy handles and removable shoulder strap; a collar-to-leash attachment; a soft, removable bottom cushion; and an outside pocket for pet and owner essentials. At 15.5 by 7.25 by 10 inches, the Classic Carrier fits under most airline pet carrier restrictions. Materials used: faux leather, tweed, mesh and mixed metal. $139;www.lazybonezz.com. Eyebrow Grooming Set and Recover-E Cucumber Eye Pads: This eye-opening combination from Earth Therapeutics, a skin and body care line, was created with the female traveler in mind. 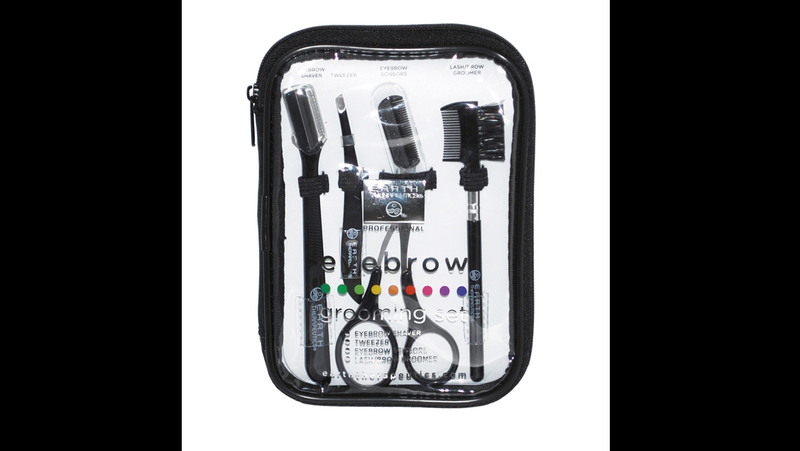 The grooming kit offers an eyebrow shaver, tweezer, eyebrow scissors and lash/brow groomer. The eye pads, which are designed to reduce dark circles and puffiness associated with the tired eyes of long-distance travelers, are infused with cucumber extract, green tea and Vitamin E when refrigerated in a cold pack. Grooming set, $14.99; eye pads, (five pairs per pack), $5.99; www.earththerapeutics.com. Cruising in the coastal waters of North America is starting to gain attention as more companies enter the market and introduce new ships to the long overlooked niche. Small, domestic ships are plying the bays, sounds and islands in New England, Chesapeake Bay, Puget Sound and the Canadian Maritimes and docking in fresh, less-visited ports of call. 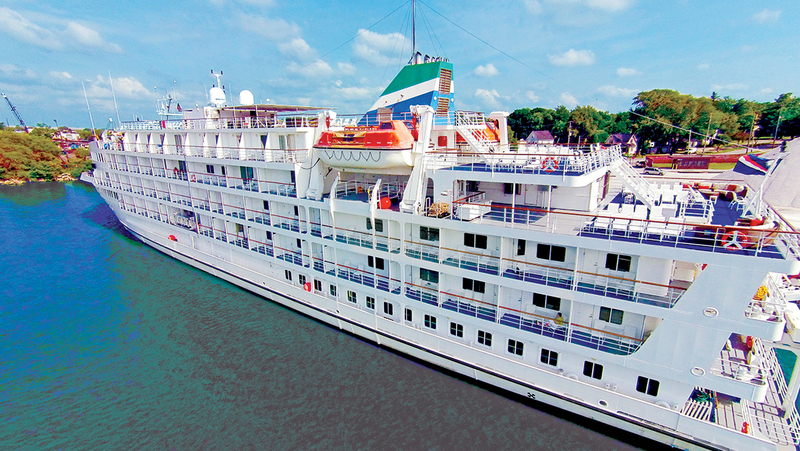 Coastal ships appeal to an older, well-traveled group of passengers seeking a small-ship experience that doesn’t require distant travel and affords easy access to places they haven’t yet seen. New entrants, such as Haimark Line and Pearl Seas Cruises, are bringing different and larger vessels to the market. And new destinations are cropping up, particularly Cuba, which coastal cruise firms say is ideally suited to their scale and style of cruising. 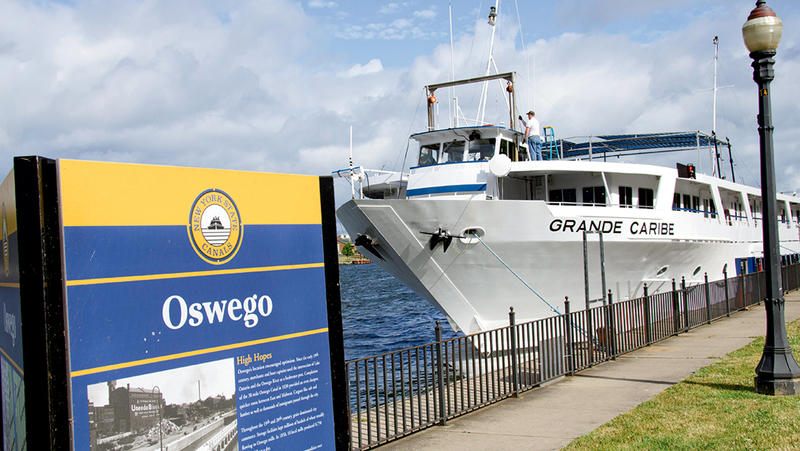 Blount Small Ship Adventures vessel the Grande Caribe at Oswego on an Erie Canal itinerary. The line says it is the only overnight cruise ship on the canal. Coastal cruising is similar to river cruising, except it’s done in saltwater rather than fresh. The ships top out at a little more than 200 passengers, cabins are intimate, getting on and off the ships is a breeze and destination is key. Price-wise, coastal cruises are also closer to many river ships, charging in the $3,000 to $5,000 range for a seven- to 10-night cruise. Each coastal company has a slightly different product lineup, with some mixing river, ocean and lake cruising depending on the time of year. And an important distinction for most coastal cruisers is that their ships are predominantly U.S. flagged, which allows for itineraries that go between U.S. ports without a foreign stop. In a sense, coastal cruising is an offshoot of the U.S. shipbuilding industry. The two oldest players, American Cruise Lines and Blount Small Ship Adventures, both own shipyards: Maryland-based Chesapeake Shipbuilding and Rhode Island-based Blount Boats, respectively. That stands in contrast to much of the ocean cruise fleet, which is built overseas, mainly in Europe. 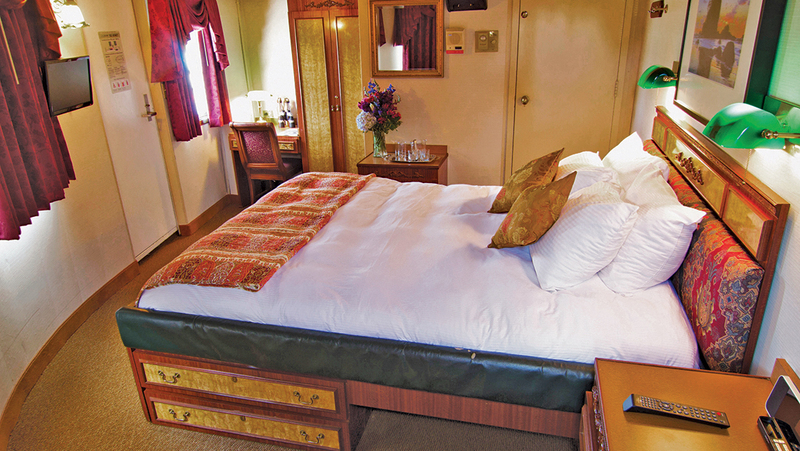 The cabins on coastal cruise ships tend to be small and cozy, like this one on the Legacy. The ships are different, too. Rather than stress luxury, coastal ships tend to have simpler, more functional decor. Several are built as modern replicas of vintage coastal steamers. The coastal ships tend to have a lounge, a bar and a restaurant that can accommodate a single seating, along with open space on a top deck for sightseeing. Most cabins range from 150 to 200 square feet. On some ships, access to cabins is from an open deck rather than an interior corridor. 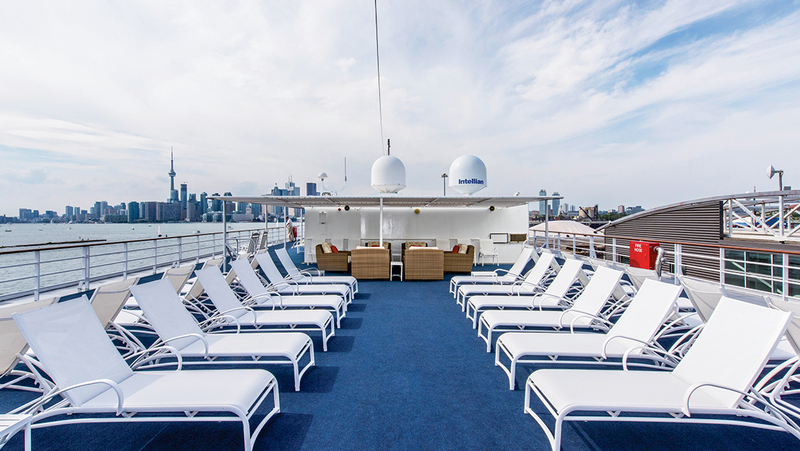 The topside sun deck on the 210-passenger Pearl Mist. Typically, coastal ships have a shallow draft, which enables ships to access close-in harbors and dock rather than tender in most ports. Blount Small Ship Adventures has engineered two further advantages: a bow ramp that permits a ship to practically dock on the beach in the Caribbean and a retractable pilot house to pass under low bridges. Because of that feature, Blount can sail the Erie Canal, along which some bridge clearances are under 22 feet. Nancy Blount, company president, said it is the only overnight cruise ship on the canal. People who gravitate toward coastal cruising are a distinct breed, according to cruise line executives. Most of them are between the ages of 55 and 75, with some in their 80s, he said. Most don’t want to be on a motor coach tour. Many have exhausted their “bucket list” destinations in exotic places that they waited their whole lives to see. Now, Markwell said, they’re on a second bucket list. Where they’re going on coastal voyages are places like the tiny towns on Maryland’s eastern shore; the historical districts of Quebec City or Beaufort, S.C.; or the peaks and evergreens surrounding the San Juan Islands in Washington state’s Puget Sound. The American Cruise Lines ship the American Spirit has 51 cabins, some with individual balconies. A classic coastal itinerary is a 15-day voyage offered by American Cruise Lines that sails from Baltimore down through the Chesapeake Bay and along the Intracoastal Waterway to Jacksonville, Fla. Along the way, passengers visit Kitty Hawk, N.C., site of the Wright brothers’ first flight; Charleston, S.C., with its side-yard colonial houses; and the turn-of-the-century robber baron retreat of Jekyll Island, Ga.
Fares for the cruise, offered in late spring and fall, start at $7,725 and range up to $13,290 for the owner’s suite on one of three American ships: the American Glory, American Star or Independence. All the ships have three decks of accommodations and carry fewer than 100 passengers. Passengers form a naturally close bond on such small ships, both with each other and with the crew, coastal cruise executives said. And the crew on U.S.-flagged ships is predominantly American, so there are no language barriers, they said. Small coastal lines do face competition from bigger, foreign-flagged ships that offer coastal itineraries of their own. Holland America Line has summer cruises on the Veendam along the St. Lawrence River, the Canadian Maritimes and in New England, while multiple cruise lines have coastal Pacific trips, including Princess Cruises, Norwegian Cruise Line, Celebrity Cruises and Royal Caribbean International. The West Coast itineraries include California ports of call such as Santa Barbara, Monterey, Catalina Island and San Diego. Because the ships are foreign-flagged, they all include a stop either in Canada or Mexico in order to comply with cabotage laws. With a draft of 25 feet, a larger ship such as the Veendam is more stable on the open ocean but less nimble in reaching small ports than coastal ships that need only six or seven feet of water. “What we’re trying to emphasize is the navigability of the vessel, because she can get to where larger ships cannot operate,” Markwell said. As an example, he pointed to the Great Lakes, where the Welland Canal between lakes Erie and Ontario limits the size of vessels to 740 feet. Jacox, of Un-Cruise Adventures, said some of the value in a coastal cruise comes from hugging the coast. At Un-Cruise, many of the shoreline excursions also have an outdoorsy adventure component, including wildlife watching, hiking, kayaking and paddle boarding, which can be done best on small ships, Jacox said. 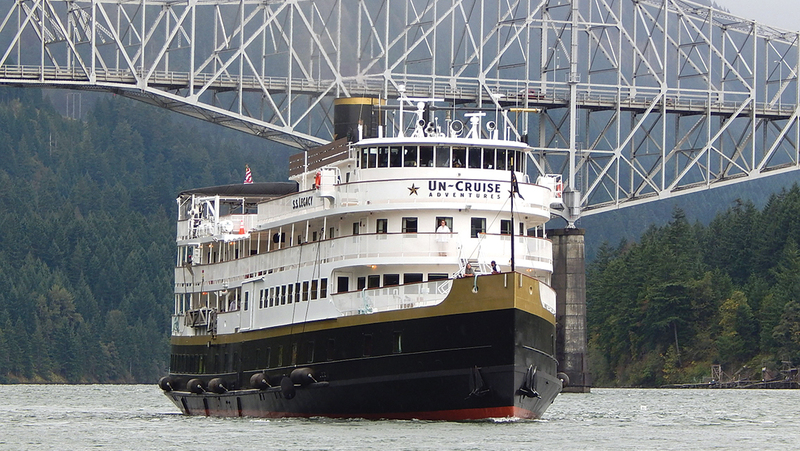 The Legacy, sailing for Un-Cruise Adventures, is a replica of a turn-of-the-century coastal steamer. Coastal lines tend to put a lot of thought into shore excursions to take advantage of their small-group dynamics. “You bring 5,000 people into Quebec City, and you feel that. You bring 200 people in, and it just feels comfortable. It’s really easy to deliver unique experiences,” Markwell said. One example is a visit to a “sugar shack” in Quebec, where maple sap is turned into syrup and candies in a small barn out in the countryside. Most coastal cruises offer at least one complimentary excursion in each port, plus several optional ones. Enrichment is another pillar of coastal cruising, and ships typically have a lecturer onboard who is an expert in the history, natural environment or other aspects of the destinations that the cruise visits. Each line includes alcohol in some fashion. American Cruise Lines offers wine and beer with dinner, plus a cocktail hour. At Un-Cruise, six of nine ships include premium spirits, fine wine and microbrews in the fare. On a Blount cruise, wine and beer are served with lunch and dinner, plus guests can bring and store their own liquor at the ship’s bar, an opportunity that “our passengers love,” Blount said. 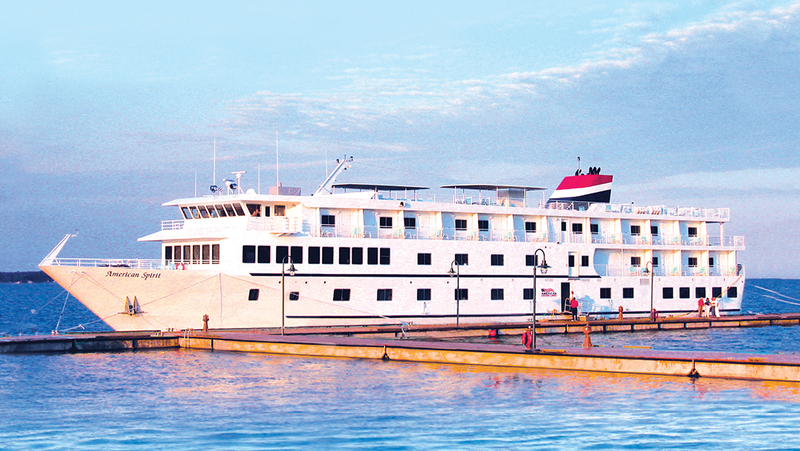 In keeping with its relaxed nature, coastal cruising’s fleet is expanding at a casual pace. The newest entrant, Haimark Line, started sailing in April using the former Cape May Light, a 210-passenger ship built in 2001 for the now-defunct American Classic Voyages. The only recent newbuild is the Pearl Mist, the sole ship sailing for Pearl Seas Cruises. It features relatively large cabins with individual balconies, a stabilizer, four decks of cabins rather than three and six lounges. Pearl Seas is the latest line to announce cruises from South Florida to Cuba, which it plans to begin in April. Cuba solves one of the challenges for coastal U.S. cruisers: where to go in the winter when most of the U.S. is too cold to be an attractive cruise destination. Several lines had focused on cruises in Central America, especially Costa Rica and Panama, where they faced little competition. But with the recent diplomatic opening in Cuba, they’re re-evaluating. The Pearl Mist is one of the few coastal cruise ships to have individual balconies. Markwell said an attractive program in the winter is a key to profits. Haimark also plans cruises from Miami to Cuba starting in February, in cooperation with United Caribbean Lines, which already has Treasury Department approval for ferry service between Florida and Cuba. Blount, too, has Cuba in its sights, though probably not until 2017. Nancy Blount said that as a U.S.-flagged vessel, there are additional complications to getting Commerce Department approvals. Jacox said that Un-Cruise Adventures will continue to operate on the West Coast of North and Central America, where it sails one ship in Mexico’s Sea of Cortez from November to March and another in Costa Rica and Panama. While it shares some similarities with river cruising, U.S. coastal cruising is small even by river cruise standards. The segment in its entirety is only a couple of thousand berths. “Because there’s very limited capacity, every time we see an opportunity, we grab it,” said Joann Bell, vice president of programming for Road Scholar, a tour operator with an educational focus. Road Scholar has chartered Haimark’s St. Laurent for two of its four cruises in August in the Great Lakes. “They have similar philosophies, so they have their own educational content onboard, which just enhances what our product type is,” Bell said. Road Scholar already sends groups to Cuba on people-to-people trips, so there is synergy in that market, as well. Other operators with a similar focus, such as Smithsonian Journeys, have also placed groups on Haimark and American Cruise Lines. Because of their small size, coastal cruise ships attract an active charter clientele. Markwell said a third of Haimark’s 15 cruises on the St. Laurent for the balance of the year are charters. Haimark, which also has river cruises in Europe and Asia, cross-sells U.S. coastal cruises to groups taking those trips. Markwell said Japan, Australia and France are among the countries that have provided passenger groups for Haimark. “Because we have grown so quickly and we need that volume, it is important for us to get into those other markets,” he said. Starting in October, Disney Cruise Line guests will no longer be able to bring spirits on board with them. The cruise line posted a change in its policy, limiting guests over 21 to two bottles of wine on embarkation or at each port of call, or one six-pack of beer. Disney was one of the few cruise lines that allowed passengers free rein to bring alcohol on board. As before, guests bringing alcohol aboard must bring it in carry-on luggage, not checked baggage. Carry-on alcohol cannot be consumed in public areas or lounges, Disney said. A corkage fee of $25 will apply to carry-on wine or champagne consumed in the dining room. Spirits or wine and beer in excess of the limits will be safeguarded until the end of the cruise, Disney said. The policy takes effect for cruises departing on or after Sept. 30.